King Sports Construction is a leader in synthetic turf field building and synthetic turf field removal and recycling. We are committed to offering the most cost effective sporting solutions. One method, recycling crumb rubber/silica sand infill from synthetic turf field removals as horse arena footing is a way we accomplish this. 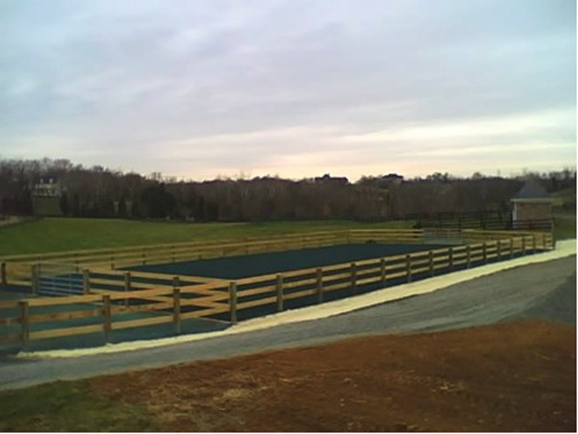 Equestrian professionals who have had the product delivered for arena footing have had positive results. One professional, Jen Tabisz of Liberty Riding Stables had to this to say " The materials have exceeded expectations. I was hoping for a close to 'all weather footing' and the materials have proved to be much more than that. This entire winter, we have yet to have a day we couldn't ride - it hasn't frozen, it drains amazingly and its super squishy for the horses. I'm very happy with it"
Phyllis Dawson, Olympic equestrian, had material delivered from us and wrote "I am happy with the product I got from you. I added it to the bluestone gravel dust and course sand footing in my riding ring to give it more softness, and it seems to be working well. Mixed with the courser sand and gravel dust, I think it makes a good arena footing." Please contact us at 301-829-7603 or via our website contact page, for availability and more information.